Guided radar sensors from Balluff are virtually predestined for maintenance-free level measurement of liquids and solids as well as for interface measurement. The guided radar pulses along the probe ensure precise and stable measurement with an absolute repeatability of ± 1mm and a maximum non-linearity of ± 2mm. The rugged sensors in IP66/ IP68 stainless steel housings have a maximum cycle time of 500 ms and independent of pressure or temperature fluctuations and unaffected by foam, vapor or dust. Buildup on the probe or container walls also has no effect on the measurement. 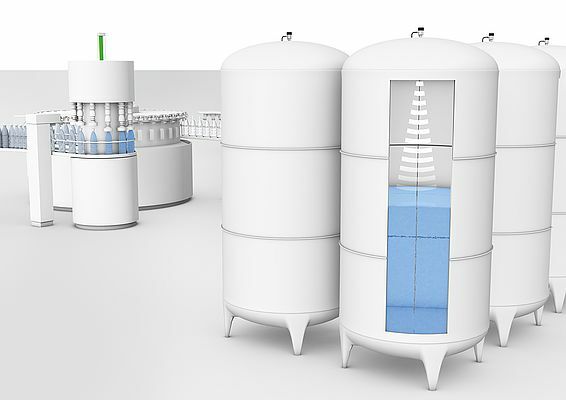 With a measuring length of up to 75 meters, these sensors enable a wide range of applications, from small filling tanks to large storage tanks - anything is possible. Their measuring principle and mechanical design make these guided radar sensors the ideal choice for use in harsh environments. Hygiene compatible versions for pharmaceutical and food applications are available. The ATEX certified sensors can also be used in explosion hazard areas as typically found in refineries and chemical processing. Simple key presses are all that is required for setup and teach-in. A highly visible display alerts the user to the status and ensure a correct and continuous overview. The measuring results are available on the output as an analog 4...20mA/HART signal.